80% of dogs and 70% of cats that don’t receive proper dental care will develop signs of dental disease by the age of three. 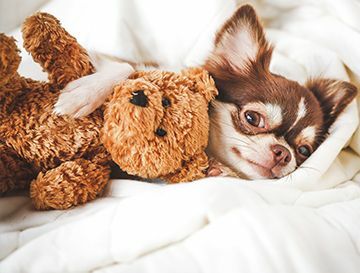 Dental disease is not only unpleasant for the pet owner when it results in bad breath, but can cause serious systemic problems in pets as well. Good oral hygiene starts at home with regular brushings and an appropriate diet. Prevention is the best answer: While the damage caused by periodontal disease is sometimes irreversible, it can be halted with antibiotics and regular cleaning. The wisest solution is to stop the disease before it starts. Brushing: The best form of oral home care is daily brushing with a soft toothbrush. 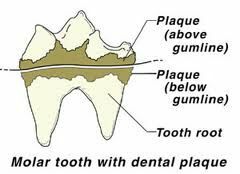 There is no better way of removing the disease-causing dental plaque. 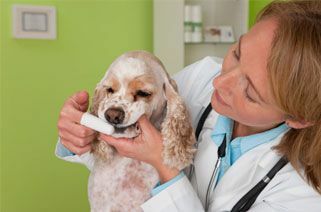 Your veterinarian can show you how to do it, and provide special brushes, toothpastes, and oral gels specifically made for pets. We can also tell you about special treats that help control dental plaque. 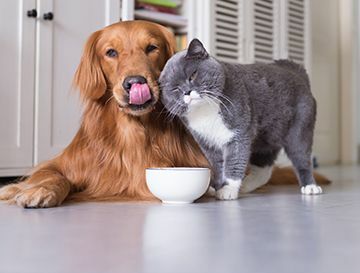 Dental diets: Dry food is generally better than canned for tooth health. However, you’ll get the best results with specially formulated foods that have been proven effective in combating plaque and tartar buildup. Ask your veterinarian for recommendations. Discharge from the nose, Drooling or excessive salivation, Pawing at the teeth or mouth, Discoloration or staining of the teeth, Red, irritated, swollen, or bleeding gums, Weight loss or loss of appetite, and Lethargy and loss of vitality. Broken Teeth: Broken teeth can be extremely painful for pets and can lead to chronic infection, abscess formation, and loss of secondary teeth. Immediate treatment is vital. Performing a root canal will save what’s left of the broken tooth and prevent it from being reinfected. Where root canal is not an option, the tooth should be extracted. 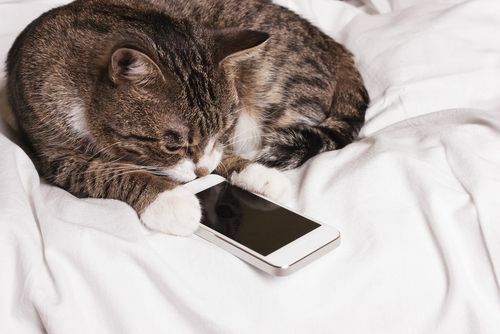 ​​​​​​​Please ask one of our staff if you have further questions about dental care for your pet or to schedule an appointment with one of our doctors. Our hospital offers Periodontic techniques to help slow periodontal disease and tooth loss. Periodontal disease is a major cause of tooth loss in dogs and cats. Periodontics involves the diagnosis and treatment of diseases of the tissues that surround the teeth. These conditions include gingivitis, periodontitis and gingival recession. Periodontal therapy includes root planing, gingival flaps and targeted tissue regeneration. Ask your veterinarian if any of these procedures would benefit your pet.